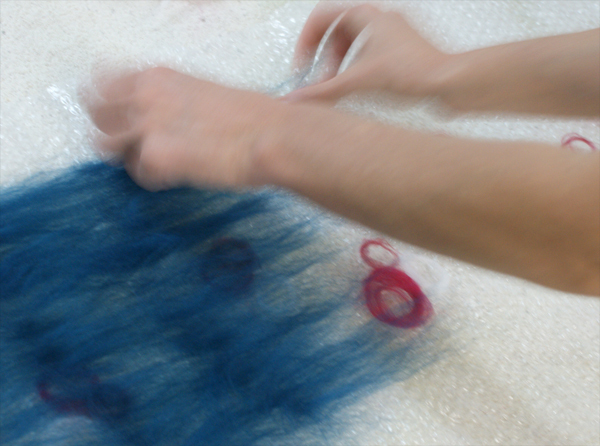 At Fleurbain, we are excited to offer a two-evening workshop, in which participants will create a formed puppet out of wet felt. The workshop takes place over two Tuesday eves in April. The puppet will be a simple “mitten” style, formed seamlessly over a form. 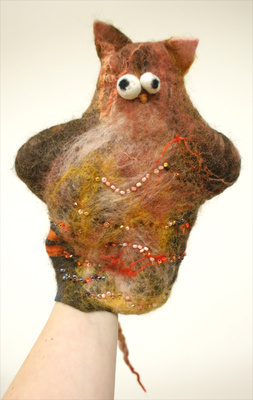 The first night students will learn the feltmaking basics, and create this formed puppet. The next week students will make round felt eyes, needle-felt decorations, and decorate/finish details on the puppet to take home. Choices can be made about “what” or “who” this puppet is… it can be a portrait, a fantasy creature, an alien… a favourite pet. This class is excellent for those who have made a flat felt object (such as a scarf) before, but is also appropriate for those who have not yet made felt. Rest assured, you will be guided through all the stages to ensure your puppet will pup! The workshop is taught by Natasha Henderson, a painter, fibre artist, arts educator, and Fleurbain’s gallery curator. Her work is exhibited across Canada, and she also offers custom workshops. TIMES: Tuesday April 16 and Tuesday April 23, 7-8:30pm each night. Workshop is held in Fleurbain, located at 460 Ste-Catherine West, H3B 1A7, Montreal. Suite # 917.